Virgin coconut oil has many benefits for the skin. Its shape makes it perfect for absorbing into skin, where it provides moisture and nutrients, improving how skin looks and feels. It naturally exfoliates skin, revealing the smoother, softer skin underneath. The antioxidants reduce redness and help heal rashes and acne. With regular use, the appearance of wrinkles is diminished and dark spots gradually fade. The versatility of coconut oil makes it easy and convenient for various purposes. The same virgin coconut oil can be used as a cleanser, acne treatment, makeup remover, moisturizer, wrinkle cream, cuticle softener, sunburn soother, itch cream and lip balm. When you add a few common ingredients, you can use it as toothpaste, deodorant, soap, insect repellent, and body scrub as well. 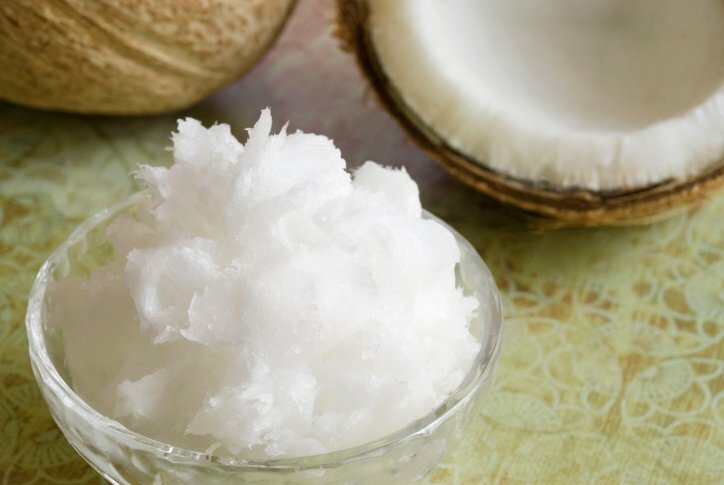 The most common use of coconut oil, other than in cooking, is to soften the skin. Because of its structure, however, it is solid below 76 degrees. Some users find the solid oil difficult to use because they feel it can be too hard to spread over skin, even though it melts after contact with warm skin. Although virgin coconut oil has a mild, pleasant coconut scent, some users like adding essential oils to give it a different or stronger scent. Essential oils can have additional benefits such as antibacterial and antimicrobial properties as well as different aromatherapy effects depending on the oils used. --1 cup of coconut oil can be whipped for 6 to 7 minutes with a stand mixer to make a body souffle that won't harden like solid coconut oil. Essential oils and a small amount of Vitamin E oil can be added for scent and additional softening. This souffle should be kept in the refrigerator if the room temperature will be above 75 degrees to avoid melting. --Adding equal parts beeswax and shea, cocoa or mango butter to coconut oil in a double boiler will make lotion bars that are solid until rubbed on skin, leaving behind a moisturizing layer. Essential oils can also be added after the mixture melts and combines. -- ½ cup almond or olive oil added to ¼ cup each of coconut oil and beeswax will be the consistency of a body lotion once melted and combined in a double boiler. Essential oils can be added after heating. If you don't have a double boiler, use a mason jar inside a saucepan with water. This mixture will keep for about 6 months, far longer than most homemade lotions. Simple coconut oil works wonders on skin, but when you want more scent or a more luxurious feel, these recipes can give you the natural skin care you need with the style of the commercial products you typically avoid because of the chemicals many contain. Biconi's 100% Cold Pressed Virgin Coconut Oil can be used alone or in the recipes above. Biconi's Radiant Skin Facial Cleanser is another great natural product that contains virgin coconut oil to nourish skin and keep it looking its best without any harmful chemicals.